David Richter’s [’79] passion impacts poor villagers and volunteers alike. David Richter helps build a home in Phnom Penh. In 1967, David Richter, age 10, returned to suburban Westchester County, N.Y., from Kenya, where he had lived for two years while his father served as deputy country director for the Peace Corps. In 2004, Richter’s son Kai, also 10, returned to suburban Seattle from Cambodia, where his parents had taken him to help build houses for poor villagers. The two events, 37 years apart, are connected by a passion that first fired young David in Kenya, was lost for a time, and now burns brightly again in Kai and his older sister, India. And in Richter himself. 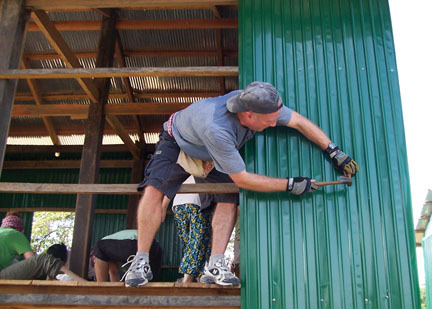 Since the 2004 trip to Cambodia with his family, Richter has returned seven times to build houses under the auspices of the Tabitha Foundation, a community development nonprofit based in Phnom Penh. Daughter India, now a high-school senior, has been on four such trips and son Kai three. Dave serves on the Tabitha U.S.A. board and, in March, led a 16-member team—including six Swarthmore students, a faculty member, and this writer—back to Cambodia. In Phnom Penh, the building team sat transfixed as Janne Ritskes, founder of Tabitha Foundation, gave an hour-long orientation that included the sad history of 20th-century Cambodia. “If you weren’t white, you weren’t much,” she said of French colonial rule of Indochina. But it was the Vietnam War—including massive American bombing for more than five years followed by a three-year reign of terror by the Khmer Rouge—that did the most damage to the small Buddhist nation. The daylong orientation also included a wrenching tour of Tuol Sleng, a school-turned-prison where the Khmer Rouge interrogated and tortured thousands, and the Killing Fields, where tens of thousands died. Richter, an international risk management and insurance consultant with his own business in Snoqualmie, Wash., has been through this sobering orientation seven times with seven different groups. He says that “as jarring and harsh and upsetting as that whole day is—then you go build. And the building is the perfect antidote.” During the next two days, led by Richter and members of the Tabitha Foundation staff, our team completed 15 corrugated tin houses in the village of Preah Nankal, about 150 kilometers northwest of Phnom Penh. Choked with emotion, Richter recalls the reactions of his son and daughter to their first house-building trips. “Kai made a collage of photos and a little diorama of the village. He did a presentation to his class, during which he read out the regulations he’d seen posted at Tuol Sleng. He had a really hard time saying, ‘While getting lashes or electrification, you must not cry out.’” (Richter has a really hard time describing this scene.) After her first trip, India gave half of her Christmas and birthday money to the Tabitha Foundation. She’s thinking about a college major in global health issues.